A). The fish ocassionally become shy & jerk their fins Trichodina Malachite Green -or- Forma-Green. B). The fins stay folded, the fish swims restlessly around, and often scrapes against objects The fish has skin parasites Treat with: Praziquantel for marine fish -or- Parinox -or- De-Los -or- Copper Sulfate. C). Many of the fish hardly move. They rock and their fins stay folded. Many cichlids darken in color Columnaris bacteria have attacked the skin Treat with: TMP Sulfa -or- Sulfa 4 TMP -or- Parinox. D). The fish swims lethargically and the flee reflex is absent. The eye reflex is disturbed or absent. They do not seek cover The fish are probably affected with blood flagellates (fish sleeping sickness) Use: Methylene Blue at 5 drops per gallon for 5 days. The fish are affected by a severe condition of the internal organs Use: Gentamycin Sulfate for 10 days. Treat once every 5 days, with a 50% water change before each treatment. b). complete exhaustion in a tank with aggressive species a). Treat with Quinine Sulfate. b). 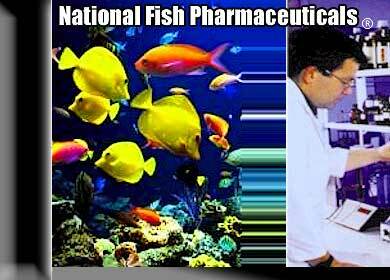 remove fish from the tank into a hospital tank and treat with Methylene Blue for 3-5 days. F). Several fish stagger around The fish are affected by Ichthyophonus fungus (ichthyophoniasis) No suitable treatment known. 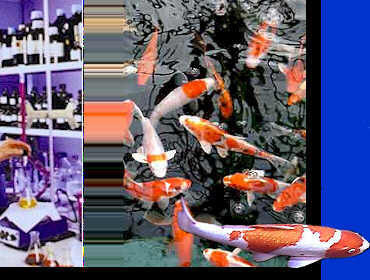 Remove dead fish immediately from tank to prevent spores from being ingested and affecting other fish. Â©1995-2004 www.nationalfishpharm.com - Site Map - Site Design by Brian Aukes & AFAM LLC.